The Class C57 (C57形) is a type of 4-6-2 steam locomotive built in Japan from 1937 to 1947. A total of 201 Class C57 locomotives were built as an improved locomotive from C55. The imperial version was used to pull from the imperial coaches. I bought this locomotive as second hand, but as it had a Japanese owner, looks like brand new. 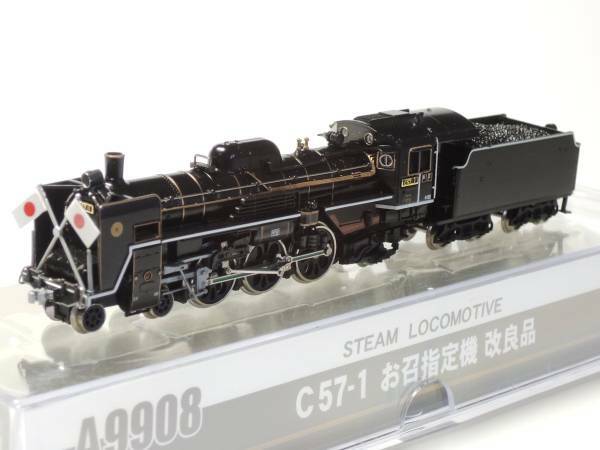 As other steam locomotive models from Microace, you have to unscrew ONE screw from the bottom, the one near the front under the first wheel. I insist there's just ONE screw fixing the shell, and is the one near the front. If you unscrew the others, you are opening the gear assembly and you will have to put again each gear and connecting roods in place. To open the tender unscrew both bogies and pull the top plastic piece simulating the coal. Before soldering any wire I just put decoder (D&H DH10) in place and see if it fits and it's possible to close again the tender. I drilled a hole in the front of the tender to cross wires for the motor and front light. Make the hole in the lowest possible position. As it closes without problem (there is plenty of space for just one simple decoder), I started soldering the current wires. You can unclip the piece fixing the cooper strips in place and solder it out of the tender. You can put the lead piece on place, while pooling from the red and black wires so the excess remains in the top. Remember to isolate the decoder so it isn't directly in touch with metallic parts. And that's the easy part, tender finished and closed. The engine is a bit difficult, and I was so concentrated and stressed while trying to cut wires at the right length and soldering them while holding the locomotive and tender, and the motor, and tin with two fingers, soldering iron in the other hand... that I didn't make detailed photos of the process!!! Sorry!! But you can pull from the motor to the back and turn it to access the cooper plates that take the current when in touch with the body. Motor is fixed to the gear assembly though a plastic and flexible tube, so probably you can pull the engine backwards enough to turn it and work on it without disassemble something. I cut those cooper plates to make them shorter and soldered the motor wires (gray and orange). Isolate it with Kapton tape, and put it in place again. Cross white wire as you can see and connect it to one of the legs of the bulb light, isolating previously this leg from the frame. And that's more or less everything, enjoy!!! !